This was a busy week for me outside of the classroom. My students were taking PARCC tests almost the entire week, which meant that I was banished to hallway patrol. This wasn’t as bad as it sounds because I quickly learned that it provided me with free time to check up on emails, get advice from other teachers, work on homework, and … FINISH MY EDTPA! This has been a long-time coming, friends. I am thrilled to say that I have completed the last major assignment of my undergraduate career (assuming that I passed all sections, knock on wood for me, will you?) This marathon of an assignment has been the bane of my existence since sophomore year. While I think it is beneficial to critically examine and reflect on teaching practices, this was a bit excessive and a huge stressor to add to the already rigorous student teaching process. 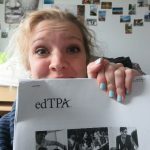 If you are reading this and haven’t yet completed your edTPA fear not, there are resources and people available to help you! You will get through it, I did! Since I wasn’t able to be in the classroom much, I decided to attend two job fairs. The diversity job fair I attended on Thursday was unsuccessful. I had signed up for it thinking that there might be some teaching positions available working with bilingual students. I quickly discovered that all they had to offer was jobs selling Italian cookware (which was quite nice since I was in the market for a new strainer) and medically based jobs. The vendors I talked to politely tried to make their positions fit with my elementary education major, but it was clear that this job fair wasn’t meant for me. The job fair I attended on Saturday was much more successful since it was only for CPS charter schools. I have had some reservations about charter schools in the past, but I decided to attend to see what was available and gain some practice talking to potential employers. In the end, I was able to apply for a job, talk with principals, and provide my resume for further contact. This week, I will finally return to a normal schedule of full-time teaching. I have noticed some behavior issues so I have created a new “Goal Setting” chart for some of our students. The chart will allow them to evaluate their own behavior on a daily basis and get teacher feedback at the end of the week. This week we will finally be wrapping up the book Frindle, opinion writing, and our Human Body units with assessments.